Apple's decency police are at it again, and this time their target is industrial-rock band Nine Inch Nails. An updated version of the new NIN iPhone application -- nin: access -- has been rejected by Apple for "objectionable content." The NIN app violated section 3.3.12 from the iPhone SDK Agreement, according to a posting on the band's online forum explaining Apple's decision. That section prohibits iPhone applications from containing "obscene, pornographic, offensive or defamatory content or materials of any kind." The objectionable material in question was a NIN song called The Downward Spiral from the album of the same name (that album is currently available for $9.99 from the iTunes Store and other fine retailers). Reznor argues that the decision to reject the app was wrongheaded since nin: access doesn't contain any objectionable material as described by Apple. The Downward Spiral, Reznor says, isn't part of the application at all, but contained in only one podcast that could be streamed through the app. The only change NIN made to the updated app was a fix for a bug that was causing the app to crash for users outside the U.S. With that in mind, Apple's objections may be redundant since the original nin: access is still in the iPhone's App Store and, presumably, could stream the same podcast with the same objectionable content as the updated app. In response to Apple's concerns, Reznor had The Downward Spiral removed from NIN servers so it can no longer be streamed with nin: access. Apple was notified of this change but has yet to approve the updated app. If Apple rejects the app again, Reznor threatens to make nin: access available to the "jailbreak community" of iPhone users instead. "I didn't invest in this appto see it languish on the sidelines from an idiotic policy while this tour is in full swing," Reznor said on the NIN forums. Nine Inch Nails is on a world tour through August 12. NIN: access is only the latest in a long list of other apps that have been rejected by Apple. Recently, the company rejected a game called Baby Shaker that showed a picture of a crying baby that stopped only when the user shook the iPhone until red Xs appeared over the baby's eyes. Apple removed Baby Shaker from the App Store after children's advocacy groups argued that Baby Shaker's premise suggested killing babies is acceptable. 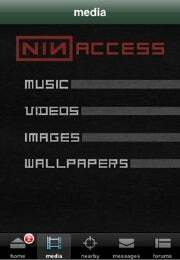 NIN: access was announced by Reznor in early April. The application has a host of features, including music, photos, videos, message boards, and a GPS-enabled feature called Nearby to find other NIN fans near you. Despite Reznor's problems with Apple, the artist was quick to point out that he still loves Apple products because, Reznor says, "they work 1000X better than the competition."